It is always a pleasure to peek behind closed doors and discover some of the treasures private art collectors normally keep to themselves. And it is always a pleasure to visit the Musée Marmottan Monet, a hunting pavilion near the Bois de Boulogne converted into an elegant residence in the 19th century and filled with a collection of fine art. The museum’s current exhibition, “Collections Privées: Un Voyage des Impressionnistes aux Fauves (“Private Collections: A Journey from the Impressionists to the Fauves”) allows us to combine these two pleasures, for a truly enjoyable outing. Since the Musée Marmottan Monet has the world’s largest collection of paintings by Monet, it is only natural that this exhibition starts with a number of works by the master, many of them unfamiliar to me, such as “Les Pyramides de Port-Coton, Effet de Soleil” (1886), depicting a phallic-looking rock sticking up out of the blue-green waves, with pinkish clouds in the strip of sky in the background. 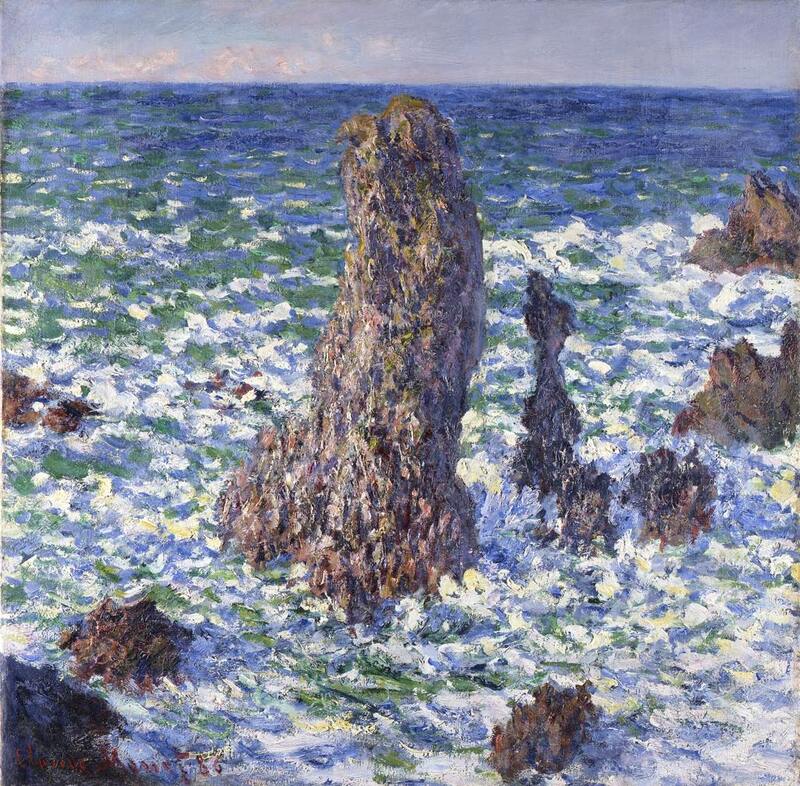 This is one of several paintings Monet made of the same scene in Belle-Île-en-Mer in Brittany, to study the effects of different weather and light conditions. It would have been nice to see more of them together, but perhaps the others were not available for loan. A number of the paintings were not new to me, probably because some of these collectors are generous in lending their works to temporary exhibitions, while others might be trying to raise the visibility of certain works in view of an eventual sale at auction. It was worth seeing them again, however, especially several works by Gustave Caillebotte, including his marvellous “Le Déjeuner” (1876), in which a man (the artist’s brother, René, who died not long after) tucks enthusiastically into his food, while a servant tends to a woman (Caillebotte’s mother) in the background. An array of meticulously painted glassware on the table gleams with reflected light, contrasting with the gloomy room, and an empty plate, perhaps awaiting the artist, sits in the foreground. Another masterpiece by Caillebotte included in the show is his “Le Pont de l’Europe” (1876). 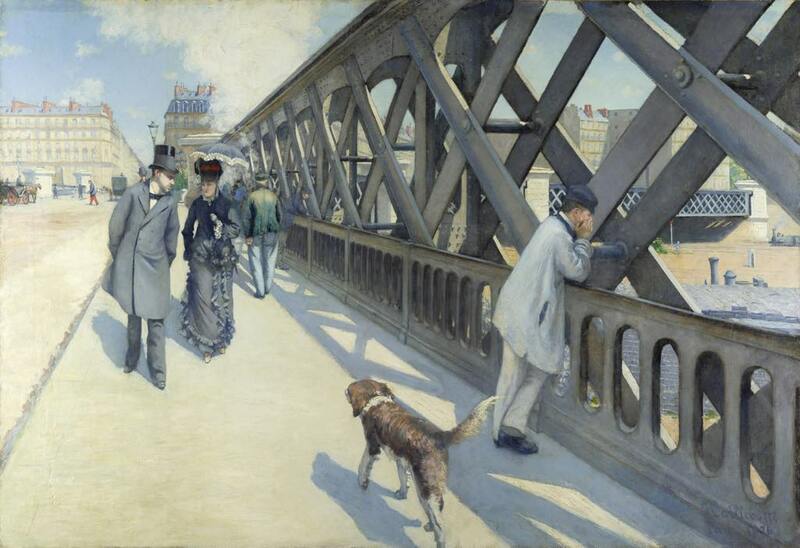 More interested in the modern world around him than traditional subject matter, he depicted an elegant couple walking on the bridge, while an errant dog walks toward them and a working-class man leans contemplatively on the railing. 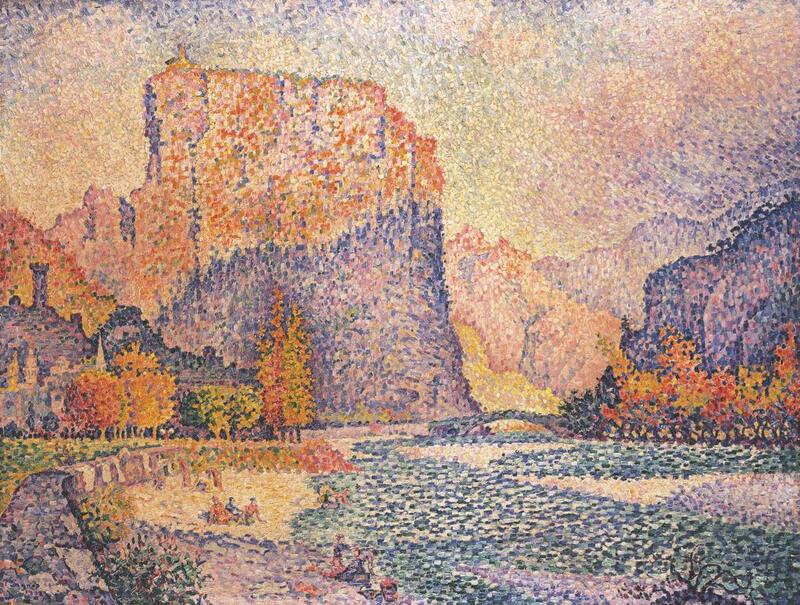 Moving forward from the Impressionists to the Postimpressionists, the exhibition features a couple of lovely works by Georges Seurat and the luminous and colorful “Castellane” (1902; pictured at the top of this page) by Paul Signac, in which a massive cliff, half in shadow, looms over a river, beside which a few people sit on a beach or wash clothing in the water. 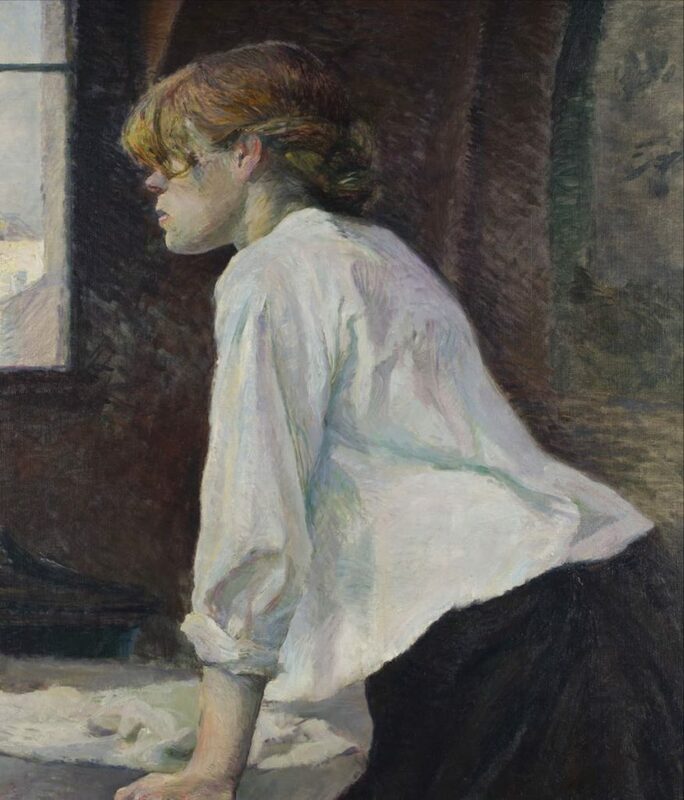 Toulouse-Lautrec, in a category of his own, is represented by three paintings, including one of my favorites, “La Blanchisseuse” (1886-1887), in which a laundress, seen in profile, leans over her tub, with her large, strong hand gripping the edge of the table. Her white blouse is gorgeously painted with subtly colored shading. 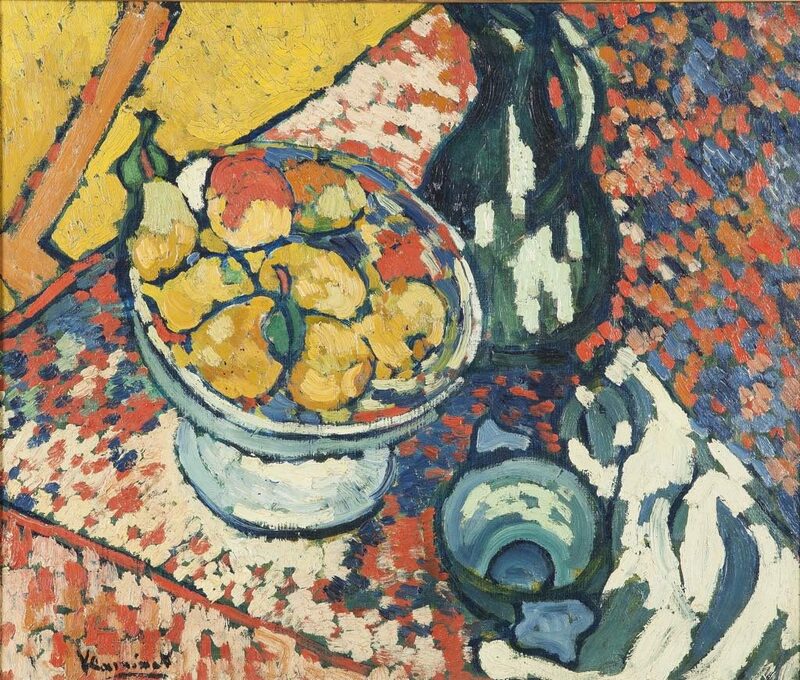 A standout from the Fauve period, Maurice Vlaminck’s vibrant “Nature Morte au Compotier” (1905), is rather less strident than some of the artist’s paintings of that time. These are just a few of the delights to be found in the exhibition. Don’t forget to take a tour of the house to see its many other treasures, from the Monet’s water lilies in the basement to a room of Berthe Morisot paintings upstairs. Timing tip: I went on a Sunday morning to this usually packed museum and found it pleasantly uncrowded. The art reviews are always a delight to read and very informative. Open Tuesday-Sunday, 10am-6pm, until 9pm on Thursday. Closed Mondays, December 25 and January 1.